Bugs are flavour of the month with Royal Mail and Jersey for Post and Go. As previously mentioned Royal Mail's new pictorial Faststamps will be available from the Post and Go machines at Autumn Stampex and nationwide from 14 September. The six designs show the Seven Spot Ladybird, Orange Ladybird, Striped Ladybird; Fourteen Spot Ladybird, Heather Ladybird, and the Water Ladybird. Two are shown here, the others and more details about these insects and the stamp design can be seen on our new web-page here. 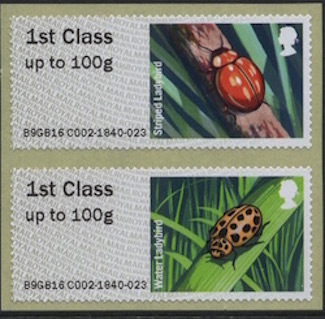 Jersey Post will also be issuing Post and Go stamps showing beetles including 4 Ladybirds.